The MSDI Transportation dataset is the most complete representation of Montana road geometry in one statewide database with address data where available. This statewide dataset incorporates transportation features and attributes from many different data suppliers. Additional data source partners are sought. If you or your organization have transportation data to share, please contact the MSDI Transportation theme lead. MSDI Transportation is being enhanced on an irregular schedule as providers' make their data available and as new transportation data is discovered online. The MSDI Transportation dataset is available as an Esri geodatabase version 10.4.1, as a shapefile, and as an ArcGIS Server web service. A layer file and a ReadMe with release notes accompanies the releases. If other data formats or versions are needed, please contact the Transportation Framework theme lead. Due to State budget cuts in 2017, the Transportation Framework is not currently being actively maintained. 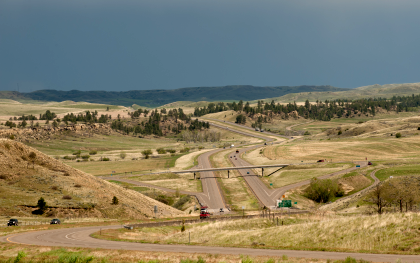 The Transportation Theme model contains multi-jurisdictional roads, ramps, bridges and trails features, and supporting tables encompassing Montana. The model is managed through a federated approach, where data from tribal, federal, state, local and private providers is contributed, standardized and then integrated into the model. Using data from these sources assures the best-possible and best-available coverage across the entire state.